Japanese media The Diplomat publishes an article titled “Why the People’s Liberation Army Navy’s underwater fleet still lags behind those of other navies” on Chinese conventional submarine. It shows experts outside China’s ignorance of China’s military modernization. In fact, the article is based on the opinions of American top expert on China’s submarines, Dr. Andrew S. Erickson, Associate Professor in the Strategic Research Department at the U.S. Naval War College (NWC). Prof. Erickson is indeed the top expert on Chinese submarines outside China, but we shall not forget the fact that China maintains strict confidential its submarine technology. Though Prof. Erickson knows Chinese language well, he does not have lots of assistants similarly proficient in Chinese language to conduct thorough search of Chinese media so as to find unexpected sources that betrayed some secret about Chinese submarines in reports not related to submarines on the surface. China’s qianzhan.com has some internal sources and in addition the human resources to search Chinese media. I often get the newest information about Chinese advanced weapons from it, but unfortunately, perhaps because of its revelation of Chinese military secrets, its military website mil.qianzhan has been closed recently. As a result, I have lost a major source of information. Such information is quite outdated. I had a post that gives a short summary of mil.qianzhan.com’s report on China leading the world in conventional submarine engine. Seeing such outdated information in Japanese media based on top American expert, I know how ignorant the US is about China’s rapid weapon modernization. I have to give more details about China’s progress in submarine technology so as to prevent the US from going into war with China rashly due to underestimate of China’s submarine capabilities. According to the website, the new engine has been developed by No.711 Research Institute specialized in research and development of various types of the power systems for China’s conventional submarines. The one with the highest technology is the AIP power system used in China’s Type 039B submarines. The AIP engine China uses in its Type 039B submarine is a Stirling Engine imported from Sweden in the 1980s. According to report, Sweden markets various kinds of Type 4-275 engines including 75kW and 110kW ones, but it only sells 75kW ones in the international market now. Sources say that at that time China imported a 75kW Stirling engine. China succeeded in copying the engine and installed China’s homegrown version in its 039B conventional submarines. On the basis of the imported Stirling engine, the special engineer team in No. 711 Research Institute has spent almost 10 years in developing a brand new type of engine entirely with China’s own intellectual property. The website says the new power system will be used in China’s new conventional submarines. The American expert is entirely ignorant about China’s fourth-generation super quiet and fast nuclear submarines. As I have given detailed description of it in my book Space Era Strategy, The Way China Beats The U.S. I do not repeat here. After losing to China with respect to the China-led Asian Infrastructure Investment Bank, the US retaliated by provoking China with its superior air force and navy. By doing so the US reveals its long-time deception in reiterating repeatedly that it does not take sides in China’s maritime territorial disputes with other claimants. Other claimants only claim a part of the area within China’s nine-dash line while the US now, alleging it does not take sides, regards all the area within China’s nine-dash line as international waters and declared its plan to send warships and warplanes into the area of dispute. Chinese Communist Party (CCP) leaders will be dismissed if they back down in the face of US superior navy and air force. CCP will be overthrown if it supports its leaders in submitting to US pressure. US strategists believe that by joining the dispute the US has checkmated China. Unexpectedly, China responded by publishing its defense white paper stating that its military’s major task is to safeguard China’s sovereignty. China’s determination to carry on its land reclamation in the South China Sea is as hard as a rock, declared Chinese Foreign Minister Wang Yi. Wang’s stance was repeated by Chinese military leader General Fan Changlong in Fan’s meeting with US Secretary of State John Kerry. China is ready to fight as it has developed enough capabilities to destroy US navy near its coast and showcased its nuclear second-strike capabilities to prevent the US from retaliating with nuclear weapons. The worst scenario is the US cutting China’s trade lifelines, but China can also use its large number of submarines to cut US trade lifelines. China at least has railway link with Europe and the Middle East through Russia while the US has no land link whatsoever with those areas. Both the US and China will suffer if there is a conventional war between them. China has to take the risk. Otherwise Xi Jinping’s Chinese Dream to make China strong to prevent China from being bullied by foreign power will be but empty talks. I said in my previous post China is certain to fight and asked whether the US was determined to fight. It seems that the US is not. US Defense Secretary switched to diplomatic approach to pit other countries against China’s land reclamation in the South China Sea but that does not seem hopeful. 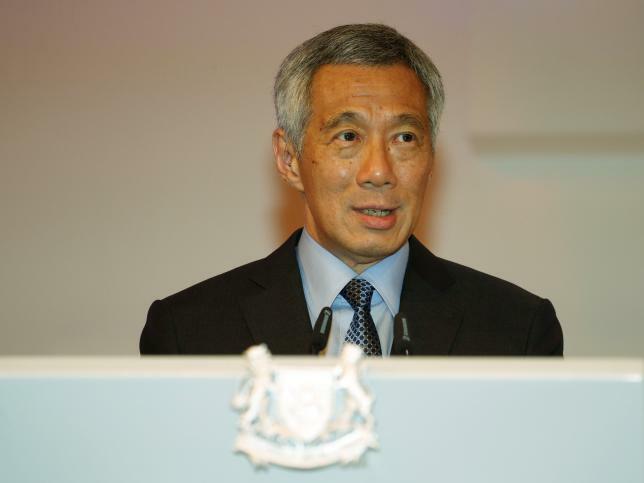 Reuters says in its report “Break the vicious cycle, Singapore tells South China Sea rivals” yesterday that in his inaugurating speech at the Shangri-La Dialogue, Singapore’s Prime Minister Lee Hsien Loong said, “No country wants to choose sides between U.S. or China”. Lee perhaps represents ASEAN’s view. What about Vietnam, a claimant second only to the Philippines in confronting China in the maritime territorial disputes? Reuters says in the report that China’s representative to the Dialogue Admiral Sun Jianguo held a bilateral meeting with Vietnam’s deputy defense minister General Nguyen Chi Vinh. Sun said on the meeting, “We believe that through mutual cooperation the two parties will be able to solve the South China Sea dispute”. The statement says, “We urge all parties … to refrain from unilateral actions, including the threat or use of force and coercion”. The statement does not specify China’s land reclamation as both China and other claimants are carrying out land reclamation. However, it specifies the threat of use of force and coercion, which is what only the US is doing. The message in the statement is clear: The EU does not want to take sides but oppose US unilateral “threat of use of force and coercion. Sad for the prospects of Carter’s failure in the Shangri-La Dialogue. Can Carter Make China’s Neighbors Force China to Stop Land Reclamation? Soon after US President Obama’s switch to pivot to Asia, his Defense Secretary Leon Panetta at that time visited China’s neighbors in an effort to encircle China. Panetta’s great hope of success lied in India and Vietnam while he was sure he had the support of Japan, South Korea, Taiwan and Thailand. Myanmar also counted as a country by US side since the US seemed to have improved ties with it and to some extent driven a wedge between Myanmar and China. Panetta neglected Russia as he believed that no efforts were necessary as Russia had already been a natural part of the encirclement because of the long-term enmity between Russia and China in history. Moreover, Obama looked down on Russia and believed Russia could do nothing. Panetta seemed quite successful. He made Vietnam allow the US to use Cam Ranh Bay. India certainly supported the encirclement due to its border disputes with China. However, US close ties with Pakistan were a problem. Chinese President Hu Jintao was wise to use Russia to counter the encirclement. As US encirclement of China may result in encirclement of Russia too and hinder Russia’s plan to develop its Asian part, Russia’s influence in India and Vietnam removed India and Vietnam from the encirclement. Now, Reuters says in its report “U.S. hopes Chinese island-building will spur Asian response” today that current US Defense Secretary Ash Carter is going to visit Vietnam and India and attend the annual Shangri-La Dialogue in Singapore to warn China’s neighbors about the threat of China’s land reclamation in the South China Sea in order to make them oppose China. Its US second attempt to encircle China, but the situation is worse for the US now than Panetta’s Asian visits. Hu’s successor Xi Jinping has intensified Hu’s diplomacy to win over Russia while Obama’s blunders have driven China and Russia closer to each other to finally become de factor allies. Japanese Prime Minister Shinzo Abe’s visit to Yasukuni Shrine has broken the iron triangle of the US, Japan and South Korea and drove South Korea closer to China. The great improvement between the two parts of China across the Taiwan Strait has removed Taiwan from the encirclement. The free trade area (FTA) between ASEAN and China has been very successful so that the two sides are discussing the way to upgrade the FTA. Only the Philippines supports the encirclement now. Vietnam needs US military support in dealing with China but relies heavily on China for its economy. As Vietnam can get advanced weapons from Russia while US weapons are too expensive, Carter would not be able to achieve much in Vietnam unless the US is able to give Vietnam much, which does not seem likely. Carter’s great hope of success perhaps lies in India as in addition to the border dispute, India has much more to complain. China’s iron brotherhood with India’s enemy Pakistan is a serious problem. The China-Pakistan economic corridor being built by China will go through Cashmere, an area of dispute between India and Pakistan. That is an even greater problem, but the threat of Chinese naval activities in the Indian Ocean is not a lesser problem. Only observers like those in The National Interest who are ignorant of the serious problems between China and India were surprised. Everybody who has some knowledge about Chinese-Indian relations knows the problems. When I talked with ethnic Indian Hong Kong residents about Chinese-Indian relations, most of them did not think the border dispute was a great issue but have serious questions about close Chinese-Pakistani relations especially the China-Pakistan economic corridor that will go through the disputed Cashmere area. If Modi had failed to mention those serious problems in his talks with Chinese leaders, the improvement in the ties between the two countries would have been but a diplomatic show without any true meaning. Let’s see what Modi actual said in the official version of his “Prime Minister’s Media Statement in Beijing during his visit to China”. Modi first says, “Our relationship has been complex in recent decades. Therefore, he has to deal with the problems along with Chinese leaders. What has he achieved in dealing with the problems? He says, “Our conversations were candid, constructive and friendly. We covered all issues, including those that trouble smooth development of our relations. The National Interest perhaps has failed to read the last sentence in my quote so that it omits it. It, therefore, believes that Modi went to China to pick a fight instead of finding a way to resolve the serious problems together with Chinese leaders. Can such complicated problems be resolved overnight? Certainly not. What Modi said in the statement about Chinese leadership being responsive meant that Chinese leaders responded positively when Modi mentioned the problems. They made Modi believe they would make efforts to deal with the problems. If Carter goes to India with the ill intention to undermine the ties that will benefit both India and China, but is not able to offer India some alternative benefit as great as what India may get from China, Carter will certainly be disappointed even if he exaggerates the threat that may arise from China’s land reclamation in the South China Sea. 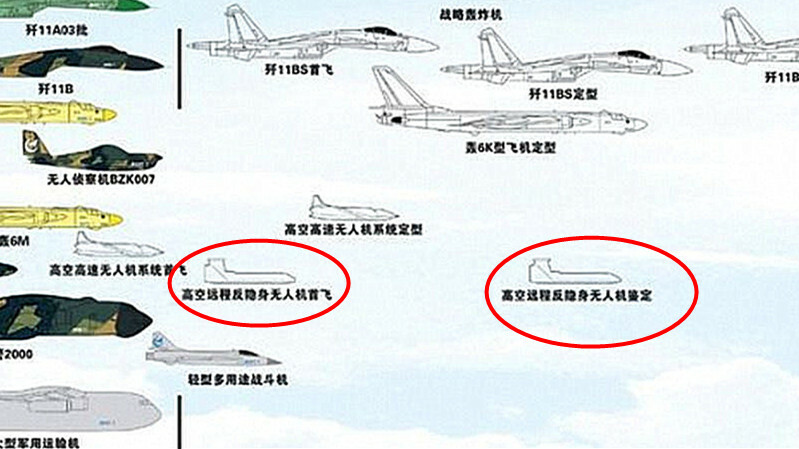 According to mil.huanqiu.com, a pedigree of China’s military drones has been viral in Chinese military media. The most mystic in the pedigree is a high altitude, long-range anti-stealth drone. There is no information about the drone except in a book titled Going Strait Forward: Aircraft Design Specialist Li Ming, which mentions Li Ming vigorously promoting the cooperation with foreigners related to a high altitude anti-stealth drone. No 601 Research Institute has developed an experimental “Shendiao” drone based on the cooperation. Recently a collection of pictures of a sci-fi drone was posted on a well-known Chinese military forum. 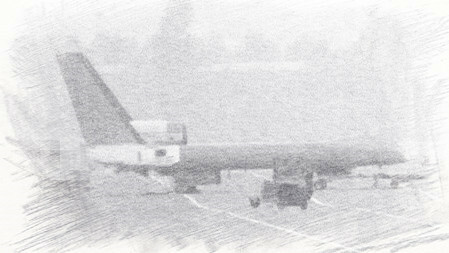 Its double-fuselage design is a unique first invention in the world. Its very large wingspan enables it to fly at very high altitude where the air is very thin. According to the website’s special military commentator Liu Zijun, the core technology of an anti-stealth drone is its early warning capability. China has already developed “Xianglong” drone, but Xianglong’s takeoff weight is too small to carry heavy load so that its range and cruise duration are limited. China needs quite a few early warning drones to coordinate with its manned early warning aircrafts as China has limited number of KJ-2000 and its KJ-200 and KJ-500 have limited cruise duration and loading capability to carry much equipment. As a result, China lacks the early warning capability beyond the first island chain. China has to develop small multifunctional cheap early warning aircrafts that are connected to network and easy to use. Shendiao is an ideal one to serve as radar sensors for a manned early warning aircraft. 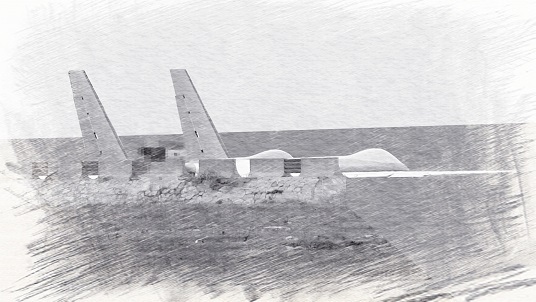 A group of Shendiaos will form a multi-based radar system with a manned early warning aircraft. 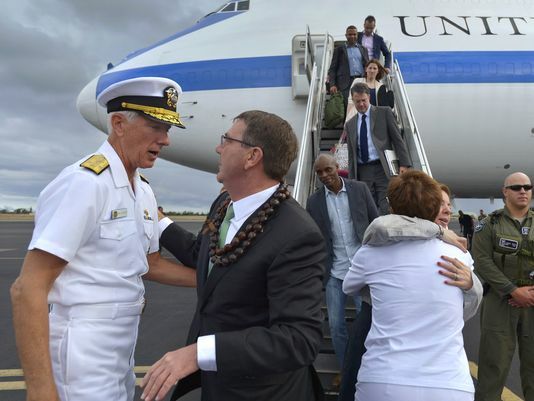 At China’s strong response to Pentagon’s plan to patrol the territorial air and sea claimed by China, US Defense Secretary Ash Carter responds by isolating China in the Pacific. It seems that the US has not determined to fight a war to stop China’s large scale land reclamation in the South China Sea. In Carter’s speech in Honolulu, he reiterated US disrespect of China’s claim to the area within the nine-dash line to confirm US intention to play the chief role in the maritime territorial dispute in the South China Sea. However, Carter said that the US wanted a peaceful resolution of all disputes and only insisted that “The United States will fly, sail and operate wherever international law allows, as we do all around the world.” He wants to show that the US does so without any specific enmity against China. It will fly and sail in any area that a certain country regards as its territory but the US regards international air and waters. Carter’s words confirm that the dispute between China and the US now is that China regards the area within the nine-dash line as its territorial waters while the US regards it as international waters. However, as both the US and China want peaceful resolution of all disputes, there certainly will be no war. The US will fly and sail and China will protest. That will be what will happen in the future. However, the Carter believes that the US has a much fiercer weapon to hurt China: It will use its influence to isolate China in the Pacific. In fact, the US tried hard to encircle China in the initial period of its pivot to Asia but failed due to China’s successful diplomacy in forming an alliance with Russia, which has influence in India and Vietnam. Since then, China has made great efforts for close economic ties with Pacific nations while the US has achieved nothing in that respect. China has free trade relations with such Pacific nations as ASEAN, South Korea, Pakistan, Hong Kong, Macau, Australia, New Zealand, Chile, Peru and Costa Rica. Its free trade area with ASEAN is especially successful. The two sides are now conducting consultations to upgrade the free trade area. The Shanghai Cooperation Organization led by Russia that includes four Central Asian countries has been quite successful. India and Pakistan wants to join and so is Iran if the sanctions imposed on Iran has been lifted. The US can only use the argument of China’s military threat to isolate China. Carter is on his way to visit and set Singapore, India and Vietnam against China. However, if China conducts land reclamation peacefully and uses the land reclaimed for civilian instead of military purposes, US trick to scare Pacific nations with China threat will not work. Moreover, if Pacific nations are and continue to be benefited by their close economic ties with China, the US will certainly be unable to sow discords between China and other Pacific nations. Therefore, if China persists to its peaceful economic approach while the US persists in relying only on military means, it seems that in the end, the US instead of China will be isolated. The publication of China’s Defense White Paper on China’s military strategy is praised by some as improvement of China’s military transparency. However, as Chinese military follows gifted Chinese strategist Sun Tze’s teaching “The art of war is an art of deception”, one shall not be so naïve as to believe that Chinese military will disclose the secret of its strategy. Why did China publish the white paper on its strategy now? The timing is very important. 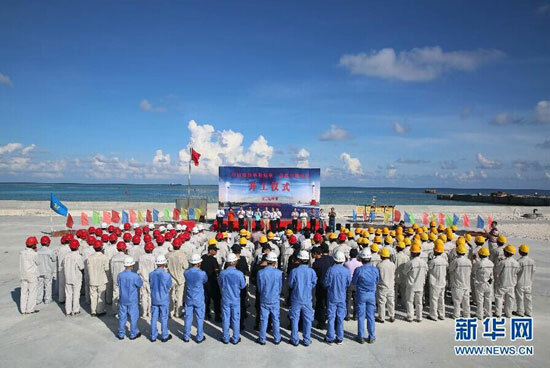 At the same time Chinese official TV media gave a show in its national primetime news of the groundbreaking ceremonies on the same day of two large lighthouses respectively on the artificial islands on Cuarteron and Johnson South Reefs. It was equivalent to a loud declaration that China will intensify its construction of artificial islands in the South China Sea instead of stopping it in spite of US military threat. The white paper declares from another angle Chinese military’s determination to safeguard China’s sovereignty over its territorial land, sea and air. What we shall pay great attention to is the paragraph on the development of China’s air force. 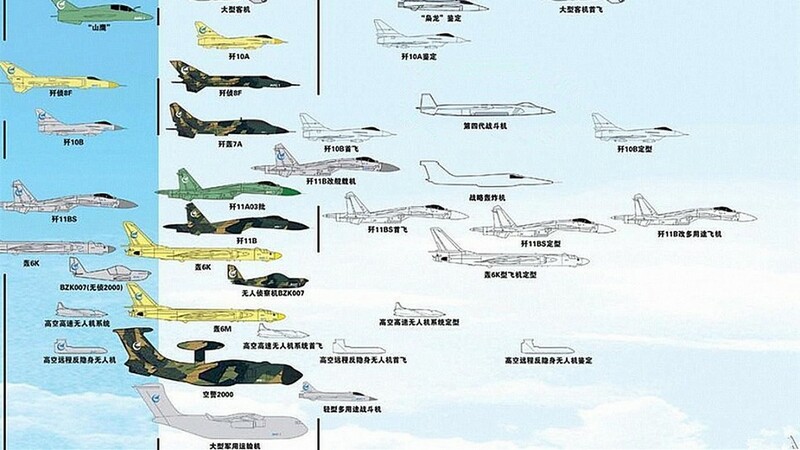 The white paper says, “In line with the strategic requirement of building air-space capabilities and conducting offensive and defensive operations, the PLA Air Force (PLAAF) will endeavor to shift its focus from territorial air defense to both defense and offense”. Offensive operations against whom? Japan or other Chinese neighbors? China can attack Japan and other neighbors with its large number of land-based intermediate missiles, strategic bombers and navy. Offenses by air-space air force is not required. Only offensive operations against the US require air force, not ordinary air force but air force with air-space capabilities, something like US X-37B China is developing. 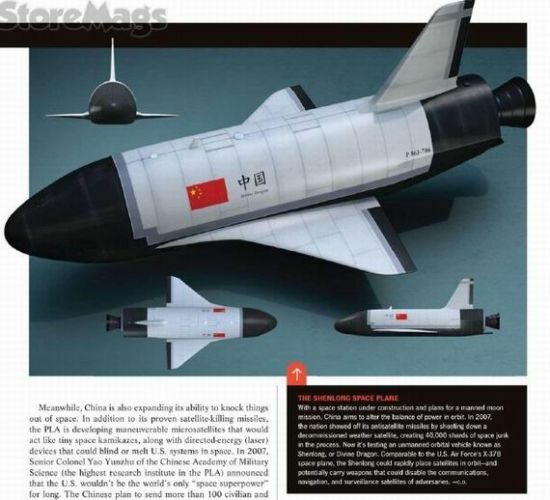 There has been quite some speculation that the mysterious Shenlong and J-28 aircrafts are China’s X-37Bs, description of which can be found in my book Space Era Strategy: The Way China Beats The U.S. 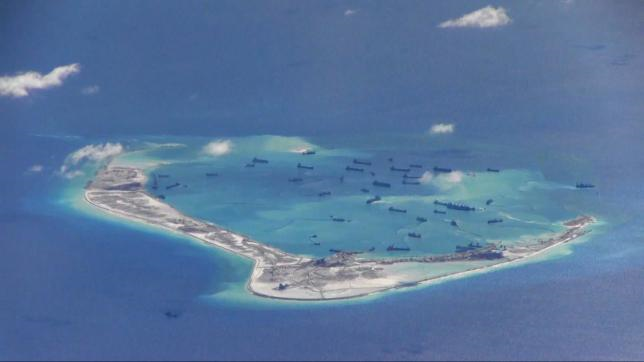 In the face of Pentagon’s next move to send warships and warplanes to patrol the areas China claims as its territorial waters, China does not stop its construction of artificial islands there but held the groundbreaking ceremonies of two lighthouses there. According to CCTV, the two lighthouses are 50 meters high and installed with a lantern 4.5 meters in diameter each. Their designed range is 22 nautical miles. In fact, in early August, 2014, China’s state-run China News Service said Chinese authorities had been surveying sites for lighthouses on five islands, known in English as North Reef, Antelope Reef, Drummond Island, South Sand and Pyramid Rock. China conduct the groundbreaking ceremonies of two lighthouses on its artificial islands on the same day on purpose and has the ceremonies shown on China’s official TV media CCTV’s primetime news as open challenge to US military move. China’s message is very clear: It will go on its large scale construction in the South China Sea in disregard of US military move. US media Daily Beast has recently published an article “History’s Next Great War Zone: The South China Sea” that believes erroneously that a war between China and the US is unavoidable as China “has declared that its South China Sea claims are a “core interest” that cannot be negotiated and the US regards freedom of navigation as something it “cannot compromise”. China has made it clear on multiple occasions that the construction on maritime features of the Nansha Islands is to better fulfill China’s international responsibilities and obligations in maritime search and rescue, disaster prevention and mitigation, marine science and research, meteorological observation, protection of the ecological environment, safety of navigation, fishery production and services, etc. The South China Sea is a vital passage for maritime transport and one of the important fishing grounds in the world. A large number of vessels pass through this area, which is under complicated conditions and vulnerable to marine accidents. China’s construction of lighthouses on Huayang Jiao and Chigua Jiao (Johnson South Reef) of the Nansha Islands is to implement China’s international obligations and responsibilities, and provide passing vessels with efficient guidance and aiding services which will substantially improve navigation safety in the South China Sea. Going forward, the Chinese side will continue to build other civilian facilities on relevant maritime features of the Nansha Islands and offer better services to vessels from littoral countries of the South China Sea and those sailing through this area. Since the construction of artificial islands and lighthouses on them are to facilitate the US in exercising its right of freedom of navigation in the South China Sea, US military provocation is entirely aimed at containing China. Freedom of navigation is but the excuse the US uses to contain China. True, the artificial islands can be used as military bases to deprive the US of freedom of navigation, but Singapore, Malaysia, Indonesia can better deprive the US of freedom of navigation through the Malacca Strait. Shall the US send warships and warplanes to provoke them?